Coming out of the first half of the show at the Almeida, I wasn’t exactly sure why this play had been picked to be produced – Before the Party, based on a short story by Maugham – but I knew something about it intrigued me. Turns out, it was exactly what I needed to experience. Present like a scalpel cut, among the frothy silliness of the family preoccupations with class, position, racist bickering and political positioning, lay a thin red line impossible to ignore. Katherine Parkinson played Laura, someone made potentially hatefully wise and apart, worthy of worship in her tragic, fragile beauty, glorious in her knowledge. I can only think of blood and wounds in terms of the metaphors I want to use. I can only think of a slow but inevitable bleed, the steadfastness of good and kind people, the ones who do their best – they are as awfully flawed as we all are, but they are elevated in their care to be transparent. Alcoholism, sibling rivalry turned hideous, shallow preoccupation with position and appearances were deeply recognisable as things we deal with now, not just existing in the silliness one associates with fictitious white, middle class characters in a large country house with servants, in a frothy play set in the past. Why did she kill him? Because he’d let her down. She had her revelation – she loved him, flaws and all, accepted and supported him and had been given his word – and spent two weeks aching to return with his son, to tell him of her devotion, only to find that he had, very simply, let her down. Things cannot always be simple, but sometimes they are. We are all flawed. We have choice upon choice upon choice in the face of opportunity. How much we care about anything else doesn’t take the flaws away, but our hope, love and faith can outrun our fear. 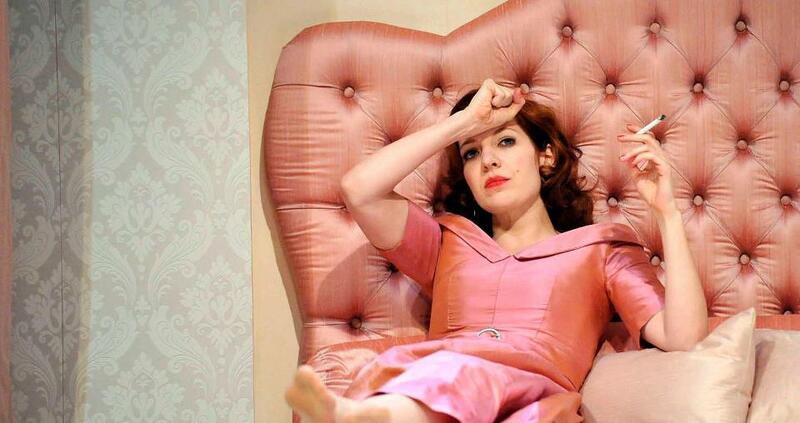 A stunning performance by Katherine Parkinson. I think Emily Lane played Susan tonight. Beautiful, as were many of the rest of the performances – I rather liked June Watson as Nanny, and Alex Price as David Marshall, but pretty much everyone was very deft and showed brilliant glimpses – and that’s all was needed – of all-defenses down humanity. It isn’t new, the device of youth bewildered and in despair over the senselessness of grown ups, the irrationality of life and religion, but this was a beautiful reminder. Some, not just children, have much fewer protective layers. Things strike quick, hard, keenly and set one spinning. I was rather a lot of tears in the second half, rather unexpectedly. The production won me over with its slow bleed which turned into a satisfying rush of joy and escape. An intriguing balancing act between the real, difficult choices and heartbreak in the midst of the absurd whirlygig that is life. Wonderful flashes of tenderness, pain, love and acceptance. A piece that reveals or questions why we ought or might harbour hope for humanity makes total sense to me. In As Good As It Gets, Jack Nicholson’s character eventually HAS to declare, “You make me want to be a better person.” This kind of thing cuts through all the crap and the noise of the party.